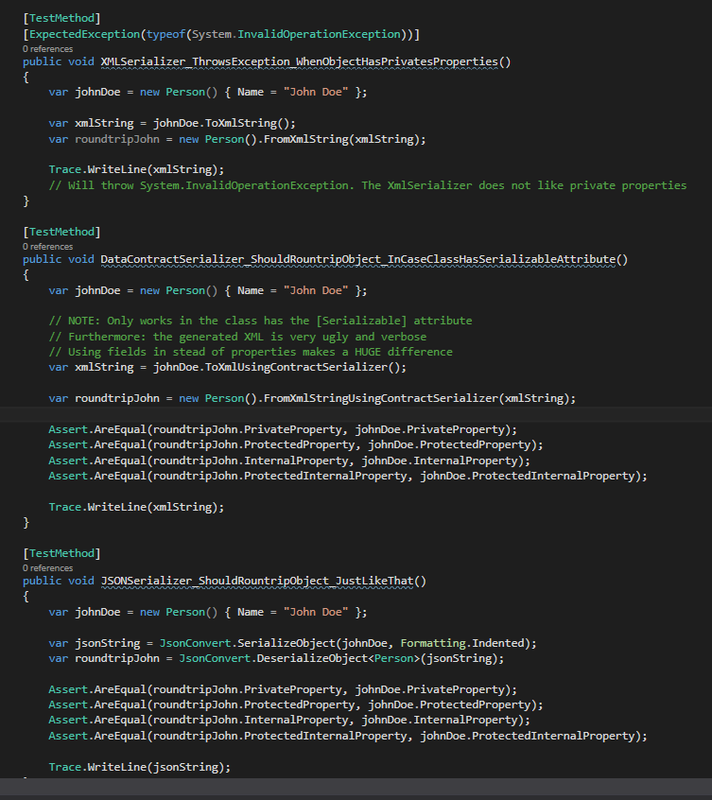 So since I 'discovered' that objects with private / protected properties can be handled by Entity Framework, I needed to make sure they can also be serialized and deserialized properly. Because in my unit tests I do not want to test the database connection, I often make use of serialized objects that I use for testing. In case you're curious: I'll be using Newtonsoft.Json from now on. 2 reasons: clean serialization format, and no modifications required on the class declaration. Cannot work with private properties. Will throw an InvalidOperationException during deserialization. Will deserialize an object properly, in case the class has the [Serializable] attribute. If this attribute is NOT present, the private / internal / protected / and protected internal properties are NOT serialized. So beware. NOTE: I did not do any type of performance benchmark, since I'm not really interested in it in the case of unit testing. Also - I did not look into serialization formats that are impossible to read ( binary or protocol-buffers ) since I want to be able to look at the data I'm using while testing.